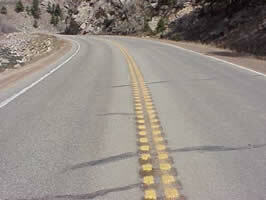 Your comments and highway safety related articles are welcomed. This newsletter is intended to be a source to increase highway safety awareness, information and provide resources to help save lives. You are encouraged to submit highway safety articles that might be of value to the highway safety community. Send your comments, questions and articles for review (electronically) to: timothy.barkley@dot.gov. Please review guidelines for article submittals. If you would like to be included on the distribution list to receive your free issues, please send your email address to: timothy.barkley@dot.gov. Welcome to the first edition of the second year of the Safety Compass and Happy New Year! We have once again compiled an issue packed with useful information on tools and success stories to help the safety community build effective highway safety programs. I continue to encourage all of you to submit information on your success stories and experiences, to help all of us improve our safety programs and reduce crashes and fatalities. Our feature story this issue recognizes the winners of the 2007 National Roadway Safety Awards, who were honored in a ceremony in Washington, DC on November 7. The 15 award winners from 12 States have implemented innovative projects and programs designed to significantly reduce crashes and fatalities. Beginning with this issue, we'll be featuring stories about some of these successful efforts throughout 2008. This issue also includes stories on international safety progress, school zone safety, highway rail grade crossing safety, and crash reduction factors, in addition to our regular features. As always, please share the Safety Compass with others in your organization and let us know if you have any suggestions for improving its content and format. Likewise, if you have thoughts about actions the FHWA Office of Safety can take to support your efforts to improve highway safety, please share those as well. The Roadway Safety Foundation (RSF) and the Federal Highway Administration (FHWA) recognized 15 local programs from 12 states across the country for excellence and innovation in operations, planning and roadway design to reduce fatalities and injuries on our nation's highways. Program categories included infrastructure and operational improvements and program planning, development and evaluation. The award recipients were selected from 61 entries received nationwide - but every nominated project submitted contributed to improved safety on America's roadways. The National Roadway Safety Awards event was held in Washington, DC at the National Press Club. One or more representatives from each winning state attended and received thanks and recognition from their peers for their teamwork and life-saving contributions. Michael Halladay, Director, FHWA Offi ce of Safety Integration welcomed everyone to the event. Executive Director, Frederick G. (Bud) Wright, Jr. of FHWA delivered key remarks and congratulated all participants in the program for a job well done. Gregory M. Cohen, Executive Director, RSF also provided remarks. Saving lives is everyone's business and concern. Your involvement in helping save lives can and will make a difference. Please keep up the outstanding work as we work together to move these numbers downward. We hope that you will participate by submitting your application for the next National Roadway Safety Award opportunity in late 2008 for a 2009 award. Throughout this calendar year, we will be publishing two or more of the award winners in this newsletter, so please stay tuned; the first five are in this current issue. will improve the quality of everyone's future. In response to an alarming death rate on South Carolina's rural secondary roads, this program was developed as a countermeasure for fatal crashes. The state maintains just over 31,220 miles of roads. With narrow travel lanes, sharp curves and very narrow shoulders, the roads offer little room for recovery for an inattentive, speeding or inexperienced driver. Unfortunately, few safety resources were available to mitigate these safety problems. Crash Reduction by Improving Safety on Secondaries (CRISOS) implements low cost, short-term engineering strategies to target the reduction of traffic injuries and fatalities on statemaintained rural secondary routes with the highest crash severity rankings. Education, Emergency Medical Services (EMS) and enforcement strategies complement engineering efforts. The South Carolina Department of Transportation (SC DOT) met with state EMS and public information and education specialists and gained their support to conduct educational efforts. Law enforcement agencies agreed to target additional enforcement on CRISOS roads. As a result, increased citations were issued and preliminary results from six CRISOS-completed roads show a 47.6% decrease in fatalities and a 16.5% decrease in injuries from a five year average. Road safety audits, using multidisciplinary teams, were utilized to identify the safety problems on selected roads and to develop prioritized recommendations for short-term, intermediate and longterm improvement strategies. Specific outreach was made to other safety partners for assistance with the program including the involvement of EMS with educational programs and both local law enforcement agencies and the Highway Patrol with targeted enforcement efforts. SC DOT was able to stretch limited financial resources with FHWA assistance in converting state matching dollars for use in funding the program. Evaluation data for all roads was compiled prior to implementation and SC DOT is continuing to collect data to determine the ongoing effectiveness of strategies implemented. 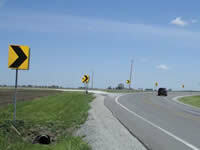 The Iowa Department of Transportation, along with the Iowa Department of Public Safety, has developed three innovative safety programs to address safety concerns on the local roadway system. These initiatives were undertaken because local governments generally lack available crash data and the expertise and resources needed to identify candidate safety locations and cost effective countermeasures. The programs remove barriers to implementing high quality safety improvements on local roadways. Examples follow. Provide free comprehensive crash data and analysis software in a Geographic Information System (GIS)-based format to local governments. Training is also provided free of charge. Additionally, local governments can request free GIS crash analysis through the Iowa Traffic Safety Data Services located at Iowa State University. 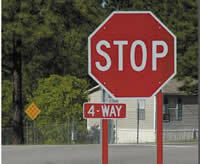 Local governments are provided a free traffic safety study at safety candidate intersections and roadways. The studies are limited to 100 hours and are provided by on-call professional transportation consultants. Local government safety projects are eligible for a safety grant of up to $500,000. This program is funded through a State Safety Program that was established with one-half of one percent of the State Road Use Tax Fund. Over 250 local government safety projects have been funded since this program was undertaken. These projects have had a mean crash reduction of 21% and resulted in a benefit of $6.90 for each $1.00 spent. The Minnesota Department of Transportation and the Department of Public Safety has undergone an extensive speed management project involving engineering, enforcement and education. Developed within the framework of the Minnesota Comprehensive Highway Safety Plan, this program was a traffic engineering project that included speed limit studies and corresponding adjustments, increased speed enforcement based on crash and speed data, and driver education in an effort to reduce fatalities and life-changing crashes on Minnesota highways. The project also included an evaluation of the effectiveness of this comprehensive approach. This evaluation showed that the program resulted in a decrease in the number of drivers who traveled at excessive speeds. In particular, there were large decreases in the number of drivers traveling at least 10 MPH above the speed limit. These decreases ranged from 11% in the Twin Cities Metro area to 30% in Greater Minnesota. 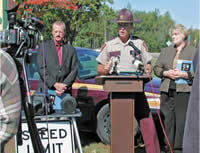 The evaluation also reported reductions in the numbers of fatal and life-changing injury crashes. A complete copy of the report can be found at www.cts.umn.edu/publications/researchreports under the title “Evaluating the Effectiveness of the Minnesota Speed Management Program”. The Florida Department of Transportation’s (FDOT) District 7 Crash Data Management System (CDMS) represents a collaboration of agencies with the shared goal to provide innovative and timely solutions to address engineering and safety issues through the analysis of crash data. This Geographic Information System (GIS)-based CDMS is equipped with tools that specifically target engineering and safety concerns, such as query-based thematic mapping, GIS-based collision diagramming, GIS-based collision comparison and Structured Query Language (SQL) query building tools along with data sharing functionality. This CDMS is able to cross reference county and state data sources to assess regional and local crash related issues. Furthermore, it has the capability to correlate safety studies, projects, work program data, roadway characteristics, Strategic Highway Safety Plans (SHSP) and crash data, together providing a better defi ned picture of crash-related problems and safety concerns. Adding to its host of benefits, the CDMS allows District 7 staff to assist other engineering and law enforcement agencies since it is entirely portable. 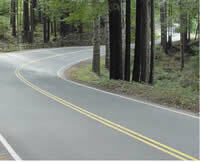 In the 1990s the Mendocino County Department of Transportation developed a program of annual Road System Traffic Safety Reviews to improve safety on its arterials and collectors by identifying accident patterns and installing improved signing and markings to mitigate hazards. The terrain of Mendocino County, a large rural county with more than 1,000 centerline miles of countymaintained roads, is mountainous with a few small valleys. Traffic related injuries and fatalities in the county are primarily the result of roadway departure crashes. The effectiveness of the Traffic Safety Review project was measured by comparing accident data for reviewed roads with data for roads not included in, or influenced by, the reviews. Over two consecutive three-year cycles, the number of accidents on the reviewed roads fell dramatically by 42.1%, while on those county-maintained roads not reviewed, they increased by 26.5%. Using cost data provided by the California Department of Transportation, the county calculates that, for an expenditure of $79,300, the project prevented between $12.6 million and $23.7 million in traffic accident losses. The results speak for themselves. Mendocino County has since expanded the Road System Traffic Safety Review program to cover its entire county-maintained road system. Safe Patrol to the Rescue! A Kentucky first, the Safety Assistance for Freeway Emergencies (SAFE) Patrol provides statewide roadside assistance. The service now covers all Kentucky interstates and parkways, as well as US 23 and KY 80 in eastern Kentucky. SAFE Patrol operators provide assistance, free of charge, to stranded or injured travelers. On August 16, Governor Ernie Fletcher announced the expanded coverage of the SAFE Patrol and unveiled one of the Patrol's 12, new extended cab pickup trucks at the Kentucky State Fair. Governor Fletcher and the Kentucky Transportation Cabinet launched the SAFE Patrol in October 2004, but it operated in a limited area. Now covering the Commonwealth border to border, SAFE Patrol has assisted over 4,000 travelers on Kentucky's interstates and parkways since the enhanced fleet of vehicles and trained operators rolled out in September. Assistance includes helping stranded motorists, removing debris, directing traffic, and assisting at accident scenes. Operators are trained in first aid and CPR, general vehicle repairs and managing accidents, among other things. Their vehicles are four-wheel-drive crew cab trucks equipped with various tools, fire extinguisher, variable message board, first aid supplies and incident management equipment. Operators can respond to transportation incidents involving cars, trucks, buses, trains - even aircraft. 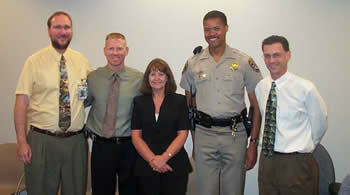 Media events have been held across the State in over 11 different regions to announce the deployment of SAFE Patrol. Media representatives even participated by riding with SAFE patrol drivers in various locations in Boone, McCracken, Johnson, and Warren counties. The fleet monitors incidents along all of Kentucky's five interstates and nine parkways, as well as US 23 and KY 80 in eastern Kentucky. Services are provided seven days per week from 6 a.m. until 10 p.m. Travelers can call 1-877-FOR-KYTC or 1-877-367-5982 for assistance. The SAFE Patrol is one of the many activities undertaken by the Transportation Cabinet to position Kentucky as a leader in highway safety and efficiency. In 2006, traffic fatalities in Kentucky declined for the first time since 1999, and the fatality rate has continued to decline thus far in 2007. For more information about Kentucky's SAFE Patrol, please contact Commissioner Tim Hazlette, Kentucky Department of Transportation Safety, or Director Mark Stapleton, Transportation Security, at 1-502-564-1438 or 1-502-564-2080. Banding Together - See the Lights! Save a Life! After several successful partnerships on safety education campaigns, The FHWA Florida Division has once again teamed up with the Florida Department of Transportation (FLDOT) to kick off a three month multi-media effort encouraging residents in District 7 to “See the Lights! Save a Life!” The purpose of the campaign is to decrease the number of traffic crashes along the U.S. Route 19 corridor in Pinellas County through Citrus County. From 2004-2006, the 95mile corridor averaged 3,555 crashes each year, with a total 134 fatalities during this same time period. The campaign kicked off with a news conference in Tampa on October 10th, which was also national “Put the Brakes on Fatalities Day.” Representatives from 13 of 15 law enforcement agencies showed up in support of the program. According to FDOT District 7 Secretary Don Skelton, law enforcement will conduct intensifi ed special enforcement details along the corridor during the campaign. Billboards reinforce our efforts spreading safety messages such as “Don’t Speed,” “Don’t Drive Aggressively,” “Don’t Drink and Drive,” “Stop on Red Lights,” “Buckle Up,” and “Watch out for Pedestrians.” In addition, public service announcements are running on television and radio. Campaign partners include Partnerships in Prevention, WTVT FOX 13, CW44 WTOG, Clear Channel Radio and Outdoor, Radio Disney, Circle K and the Tampa Bay Lightning professional hockey team. “See the Lights! Save a Life!” safety education campaign precedes an upcoming construction project to install 250 new light poles on both sides of U.S. Route 19 along a 5.5 mile stretch of the corridor in Hernando County. The six month project is expected to start early 2008. The U.S. Route 19 corridor was named by Forbes Magazine (7/13/ 07 Robert Malone, Author) as the deadliest road in America citing 38 fatalities in 2005 on a 30 mile stretch of the road, according to the National Highway Traffic Safety Administration (NHTSA). Although the FLDOT and FHWA Florida Division are constantly looking for ways to improve the State’s road and highways, they are also using safety education campaigns such as “See the Lights, Save a Life” to improve driver behavior. One-third of the traffic crashes on U.S. Route 19 were related to aggressive driving. For more information, please contact:FHWA: Hussein Sharifpour (850) 942-9650 ext. 3024 or FDOT Peter Hsu (813) 975-6251. Sidewalks have traditionally been the domain of pedestrians and cyclists. Recently, these conventional sidewalk users have had to share space with low speed motorized transportation devices such as scooters, wheelchairs, and other personal mobility devices. One such personal mobility device is the Segway™ Human Transporter (HT). 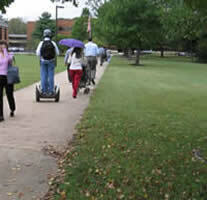 Currently, little research exists on the Segway and how it interacts with other road users. To help answer some questions about these interactions, the Federal Highway Administration investigated the riding behaviors of experienced and novice Segway users. During the first experiment, experienced Segway riders were asked to ride the device using the three speed keys. The black speed key has a top speed of 6 MPH, the yellow speed key has a top speed of 8 MPH and the red speed key has a top speed of 12.5 MPH. During their rides, Segway riders were asked to make several planned and unplanned stops. Results indicate that Segway users generally travel at or near the top speed allowed by the speed key. Riders took longer to bring the Segway to a complete stop during unplanned stops. It also took riders longer to stop the Segway when traveling in faster speed keys than in slower keys. Riders were usually accurate in estimating the speed they were traveling on the Segway in each of the speed keys. However, regardless of speed key or stop type (planned or unplanned), riders tended to underestimate the distance it took to bring the Segway to a complete stop. In the second experiment, experienced and novice riders were asked to navigate the Segway through nine different sidewalk/obstacle scenarios using the yellow speed key (top speed 8 MPH). Riders were asked to navigate around barrels, cones, and pedestrians while traveling on a wide (10.2 ft 3.10 m) or narrow sidewalk (4.42 ft 1.35 m). These results indicated that both novice and experienced Segway riders are able to pass a variety of obstacles without major difficulties. Riders tended to pass objects slightly faster and closer on narrow sidewalks. Experienced riders tended to pass obstacles at a greater clearance distance and faster speed than novice riders. The clearance distance for both novice and experienced Segway riders was greater in passing pedestrians compared to the clearance distance for stationary objects. 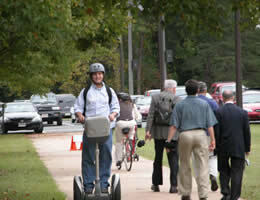 This final Segway report is expected to be available in early 2008. For more information, please contact Amanda Emo Amanda.Emo@dot.gov or Ann Do at: Ann.Do@dot.gov, FHWA Office of Safety Research & Development. 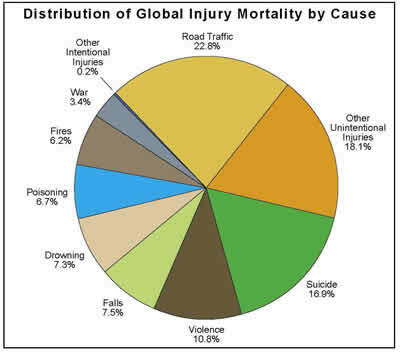 Injuries and fatalities resulting from road crashes are steadily increasing around the world. Estimates by the World Health Organization--over 1 million killed and as many as 50 million injured each year--are disturbing. Countermeasures to improve this situation include the exchange of best practices, strategies and processes. The Federal Highway Administration (FHWA), along with its sister agencies National Highway Traffic Safety Administration (NHTSA) and Federal Motor Carrier Safety Administration (FMSCA), and its partners frequently hold information exchange meetings with their counterparts from other countries. Following are several examples of the many international visitors that come to the United States to visit government, public and private organizations. Australia – Work zone safety was the topic of discussion with Mr. Mark Collins, General Manager, Occupational Health and Safety, Roads and Traffic Authority, New South Wales. The FHWA provided an overview of U.S. highway safety and shared information about Federal regulations for highway construction work zone safety and mobility, safety grant initiatives, and barrier system technologies. Mr. Collins mainly deals with policies and management systems to protect the health and safety of employees. New leadership of his organization established a Center for Road Safety Excellence and he highlighted some of the efforts being undertaken to incorporate safety at the project’s inception. Mr. Collins is pursuing getting worker safety integrated into road safety measures. Russia – Collaboration between government and non-government entities was the point of interest of Mr. Leonid Smirnyagin and Ms. Svetlana Bozhkova, members of a research team of the Center for Strategic Research-Region (CSR-Region). Road safety in Russia attracts high-level attention, and the Russian government recently launched a program called “Enhancing Traffic Safety in the Years 2006-2012.” The CSR-Region researchers are visiting different countries (United States, Sweden, France, Australia, etc.) to gather information to propose projects to enhance Russian road safety. Among the issues discussed by the FHWA and NHTSA staff were safety partnerships, strategic plans, and data analysis. South Africa - Ms. Cielie Karow, Deputy Director for Accident Investigation and Information of the Road Traffic Management Corporation of South Africa, visited Washington, D.C. and Sacramento, California. In Washington, she met with the FHWA, NHTSA, and FMCSA representatives to exchange information on crash data collection, analysis and investigations. The FHWA discussion centered on using data to identify problem areas and establish priority countermeasure programs that address the identified problems. Injuries and fatalities resulting from road crashes are steadily increasing around the world. In California, Ms. Karow met with personnel in the FHWA California Division and with representatives of the California Highway Patrol (CHP) and the California Department of Transportation (Caltrans). The CHP provided information about its Statewide Integrated Traffic Records System (SWITRS), the form used to collect information at the crash scene, and the procedures for closing roads to conduct crash investigations and the compilation of many statewide statistics. Caltrans described its process of receiving data from the CHP to create its Traffic Accident Surveillance and Analysis System (TASAS), discussed how TASAS is used to generate quarterly reports of locations requiring investigation, and explained how TASAS is used to calculate expected benefit/cost ratios of proposed safety improvements. Ms. Karow noted numerous similarities between South Africa’s programs and those of the United States. She described her Department’s Accident Report Form which is completed for all crashes, and Arrive Alive Quick Response Form for Culpable Homicide Motor Vehicle Accidents for fatal crashes and its ability to provide fatality data in real-time. She also shared information about a pilot test underway to improve the process of locating crashes. Using a cell phone, the investigating officers “call in” when they arrive on the scene of a crash. The “call in” geospatially locates the incident, based on a GPS unit within the cell phone, and the coordinates of the location are directly reported into the central database record for that particular crash. Tremendous benefits are derived through the exchange of information and knowledge sharing, both to the visiting groups and to U.S. safety personnel who meet with them. International cooperation through knowledge sharing can ultimately lead to improving road safety worldwide. Techniques and approaches may differ globally for improving highway safety, but the ultimate goal is the same. All across the world reducing the number of fatalities and injuries occurring on roads and streets is a priority. Road crashes are the leading cause of death worldwide among young people between the ages of 10-24. Effective solutions to help solve this global issue are advanced through active exchange of information among countries. Recently, the FHWA’s Office of Safety participated in two international activities—The World Congress on Intelligent Transport Systems and The World Road Congress. The World Congress on Intelligent Transport Systems is an international meeting and exhibition that rotates among three geographic regions (Americas, Europe, and Asia Pacific). This year it was held in Beijing, China, where different governments and organizations from around the world shared information. Jeffrey A. Lindley, Associate Administrator for FHWA Safety, participated in an executive session entitled “Global Safety” and discussed safety oriented ITS applications that address some of the most pressing safety problems in the United States, such as runoff-road and intersection crashes and the deployment challenges for these applications. Jeff also made a presentation on using advanced technology to improve pedestrian and motorcycle safety. Next year’s meeting will be held in New York City on November 16-20, 2008. The World Road Congress, which is held every four years, is organized by the World Road Association, commonly known as PIARC, an international nonprofi t organization that represents 98 countries in both developed and undeveloped parts of the world. The United States is an active member. PIARC operates technical committees that undertake studies and prepare reports and papers on various topics related to roads and road transport issues. Beth Alicandri, Director of the FHWA Office of Safety Programs, is a member of Technical Committee C3.1, Road Safety, and she participated in meetings and technical sessions which the Committee sponsored at the recent World Road Congress held in Paris, France. Enhance public health and safety by working toward the elimination of transportation-related deaths and injuries. Improve safety performance through program delivery, technical assistance, research, training, data analysis, and public information. The FHWA works with safety partners to heighten safety awareness within the highway community, business, industry, and travelers. Reducing roadway departure, intersection, pedestrian, and speeding related fatalities and serious injuries. The FHWA Office of Federal Lands Highway is pleased to announce the availability of the DVD entitled “Tribal School Zone Safety: Video & Toolkit.” This is a great educational tool for school aged Native American children, as well as parents, guardians, transportation coordinators, and Tribal leaders. The DVD consists of two videos, a toolkit with education materials, a literature review, and video clips and photos. They intend to educate young children on pedestrian safety as well as making the Tribal public aware of pedestrian issues and providing resource information. The FHWA Office of Safety completed the Railroad-Highway Grade Crossing Handbook - Revised Second Edition. This handbook supersedes the Railroad-Highway Grade Crossing Handbook, published in September 1986. This update includes a compendium of materials that were included in the previous version of the handbook, supplemented with new information and regulations that were available at the time of the update. Updates were drawn from the current versions of relevant legislation, policy memorandum, Federal Register notices, and regulatory actions, such as SAFETEA-LU, Federal Railroad Administration (FRA) train horn rule, 03 Edition of MUTCD, etc. The purpose of the Railroad-Highway Grade Crossing Handbook – Revised Second Edition is to provide a single reference document on prevalent and best practices, as well as adopted standards relative to highway-rail grade crossings. The handbook provides general information on highway-rail crossings, characteristics of the crossing environment and users, and the physical and operational improvements that can be made at highway-rail grade crossings to enhance the safety and operation of both highway and rail traffic over crossing intersections. The guidelines and alternative improvements presented in this handbook are primarily those that have proved effective and are accepted nationwide. You may also review the Handbook online at: http://safety.fhwa.dot.gov/xings/07010/ in HTML format. Research Results Digest 302 presents five core competencies for highway safety professionals practicing in any mode or specialty, supported by 37 learning objectives. Specialists may have or require additional competencies in their own field or organization. The competencies were developed by the Transportation Research Board (TRB) Subcommittee for Highway Safety Workforce Development, representing the National Highway Transportation Safety Administration (NHTSA), Federal Highway Administration (FHWA), Governor Highway Safety Association (GHSA), American Automobile Association (AAA), professional associations, and academia. The competencies may be used to assess individual abilities, determine workforce requirements, develop curricula, assess course materials, target professional development, and provide cross training. The authors, Paul Jovanis and Frank Gross, also identify that few if any universities offer much training in highway safety, in either civil engineering or public health. For more information, please contact: Charles Niessner, TRB at: CNiessner@nas.edu. We hope that a Highway Safety Fundamentals course can be the foundation for a series of NHI and Transportation Safety Institute (TSI) courses recommended to federal employees for cross training. NHI is already looking to recommend a series of existing NHI courses for a “certificate of completion” program, and Ben Gribbon, of FHWA Safety is mapping a series of courses and projects that can assist transportation safety professionals. TRB Special Committee for a Study of Supply and Demand for Highway Safety Professionals in the Public Sector has completed Special Report 289 – Building the Road Safety Profession in the Public Sector. The report indicates that the lack of professional recognition and comprehensive road safety education and training opportunities threatens the ability of agencies to build the knowledgeable and skilled road safety workforce needed to make safety advances. To address this need, the report recommends that AASHTO & GHSA forge a broad-based alliance of public, private, and educational organizations to champion the road safety profession. Please contact Tom Menzies, TRB at: TMENZIES@nas.edu for more information on this subject. In addition, the AASHTO Standing Committee on Highway Traffic Safety (SCOHTS) has recommended a specific NCHRP project to address these results, starting with a Safety Workforce Summit. Please contact Ben Gribbon, FHWA at: ben.gribbon@dot.gov for more information on this subject. Recently, the Federal Highway Administration (FHWA) published a “Desktop Reference for Crash Reduction Factors” and supplemental “Toolbox of Countermeasures” for intersection, pedestrian and roadway departure crashes. This article describes crash reduction factors and their potential uses, and provides additional information related to the use of these recently released resources. What is a Crash Reduction Factor (CRF)? A CRF is the percentage crash reduction that might be expected after implementing a given countermeasure at a specific site. However, in some cases the CRF may be negative, indicating that the implementation of a countermeasure is expected to lead to a percentage increase in crashes. For example, if a county chose to install cameras to detect red-light running, they might expect a 25% reduction in right angle crashes, but a 15% increase in rear end crashes. What are the benefi ts of using CRF's? Which countermeasures might be considered at the signalized intersection of Maple and Elmstreets, an intersection experiencing a high number of total crashes andleft-turn crashes? What change in the number of total crashes and left-turn crashes can be expected with the implementation ofthe various countermeasures? The installation of centerline rumble strips on a two-lane roadway can potentially show a 14% reduction in all crashes and a 55% percent reduction in head-on crashes. 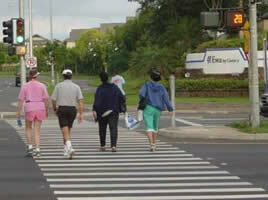 The installation of pedestrian countdown signals can potentially decrease pedestrian fatal and injury crashes by 25%. Many States and local jurisdictions use CRF’s to make program-planning decisions about implementing specific treatments and/or to quickly determine benefits of particular treatment. 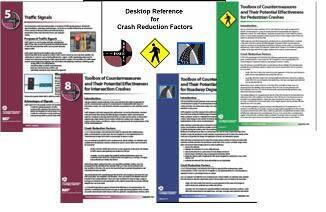 The CRFs presented in the Desktop Reference are a compilation of all the known CRF information available to date; whereas, the CRF’s contained in the “Toolbox of Countermeasures” for intersection, pedestrian and roadway departure crashes contain the “best” available information on countermeasure effectiveness in terms of CRF’s. A CRF should be regarded as a generic estimate of the effectiveness of a countermeasure. The estimate is a useful guide, but it remains necessary to apply engineering judgment and to consider site-specific environmental, traffic volume, traffic mix, geometric, and operational conditions which will affect the safety impact of a countermeasure. The user must ensure that a countermeasure applies to the particular conditions being considered. The CRFs in this Desktop Reference may be periodically updated as new information becomes available. Therefore, we strongly encourage users to provide their feedback related to concerns or confl icts with current documents; clarifi cations of existing documents; and new ideas or countermeasures for the next release. December 15-31 NATIONAL Drunk Driving.